Our English learning app will help you learn phrasal verbs inuse.You will improve your English grammar and speaking in 10minutes aday! 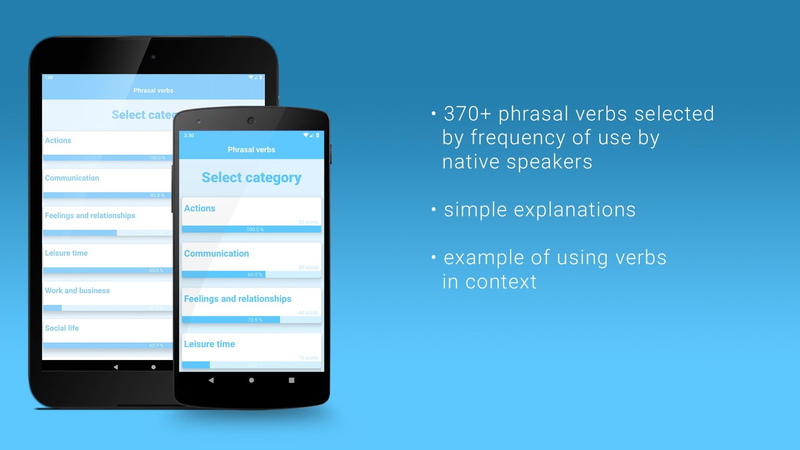 In our application you will find: - Training bylistening forabout 400 most useful phrasal verbs, divided bycategories andselected according to the frequency of their use inlife and exams- Phrasal verbs with meanings and examples - Trackingyour progress- Intellectual training algorithm - Practicepronunciation ofphrasal verbs - Exercises and quiz - Offlinetraining mode -Learning English effortlessly It is very easy touse! You can findaround 400 common and useful expressions orphrases which you canuse to improve your English skills and becomefluent Englishspeaker With Phrasal Verbs Dictionary offline app youcanunderstand and learn phrasal verbs list with: Ask, Back,Begin,Blow, Break, Bring, Build, Call, Carry, Check, Come, Cut, Do,Drop,Fall, Get, Give, Go, Hand, Hear, Hold, Keep, Let, Live, Look,Make,Move, Pay, Pick, Pull, Put, Run, Set, Stand, Start, Stick,Take,Talk, Throw, Try, Turn , etc. Verbs list divided by theme. Youwillfind phrasal verbs about work, travel, money, relationships,sociallife, basic actions, disaster and recovering Improve yourspeakingand listening skills, boost your English vocabulary, speaklike anative, pass IELTS, TOEFL, CEFR, CAE or other ESL exameasily!Studies have shown that traditional methods of memorizingwordswork inefficiently. The most successful way to learn alanguage isthe natural way you have learned your first language asa child bylistening it a lot. Based on these studies, we createdanapplication to study most common phrasal verbs that are mostoftenfound in everyday conversations and IELTS, TOEFL exams. Also,thesevocabulary will be useful to know for Reading and Speakingparts ofany ESL exams. Check your vocabulary to get a high score for IELTS Test andmakeyour way to study at a dream university or immigrationeasier!Prepare for the IELTS Listening for band 8+ using our app.Justlisten and enter what you hear, to learn how to easilyunderstandand learn over 1000 of the most frequent words andphrases and lastbut not least for passing IELTS exam - theirspelling. In ourapplication you will find: - Training for the studyvocabulary(more than 1000 words and phrases) for IELTS Listening,selectedaccording to the frequency of their use in the exam - Wordswithdefinition and examples - Tracking your progress -Intellectualtraining algorithm - Practice pronunciation of commonnames andphone numbers from IELTS Listening part - Practicespelling mostuseful words for IELTS Listening - IELTS quiz -Learning IELTSvocabulary 5 times faster, than using traditionalmethods - 1000most useful words for IELTS with audio support - 1000most usefulphrases for IELTS with audio support - Offline andOnline listeningpractice mode Studies have shown that traditionalmethods ofmemorizing words work inefficiently. The most successfulway tolearn a language is the natural way you have learned yourfirstlanguage as a child. Based on these studies, we createdanapplication to study the words that are most often found inIELTSListening part of IELTS exam. Also, these vocabulary will beusefulto know for Reading and Speaking parts of IELTS (for bothGeneraland Academic IELTS British Council and IDP). 1. Basic English Grammar Topics and Tests - Basic terms like noun,pronoun, adjective, verbs, adverbs, etc. - Tenses : Simple PresentTense, Present Continuous Tense, Present Perfect Tense, Simple PastTense, Past Continuous Tense, Past Perfect Tense, Future Tense,etc. - How to use Do, Does, Did - How to use Be, Being, Been - Howto Use Wh Questions like Why, How, What, Which, Whose, Where -difference between Who and Whom - difference between What and Which- difference between This and That / These and Those - differencebetween Much and Many - difference among In, At, and On - Type ofDegrees of comparison or Use of Degrees of comparison - How to useQuestion Tags and Question Tags Rules - difference between Shouldand Could and Would - difference between May and Might 2. AdvancedEnglish Grammar Topics and Tests (Quiz) - difference betweenBetween and Among - difference between Beside and Besides -difference between Since and For - difference between Until andUnless - difference between So and Such - difference between Someand Any - Use of Used to - Use of However - Use of Having, Use ofHaving Said That, Use of Having To - Use of word "The Hell" 3.Basic and Advance English dialogues 4. Most used Phrasal Verbs likePick Up, Hang Out, Break Down, Look Forward, Take Off, Take On,Take Over, Get By, Get Across and many more useful Phrasal Verbs.5. List of opposites, words in pair, proverbs, etc. 6. Grammartests collections for checking your grammar skill. 7. Randomexercises for basic and advance English grammar topics. 8.Preparation for IELTS, TOEFL, SAT, MCAT, LSAT, GMAT, GRE. 9. Toomany examples of all the basic and advanced English learning andspeaking 10. Learn English quickly by highlighted points. This app helps you how to learn English Tenses very simple andexact way. You can improve your knowledge of all tenses in theEnglish Language. In this app you can study tenses by usingdifferent ways like, affirmative use of tense, Negative use ofTense, interrogative tense, interrogative negative use of tensesand this app also helps you to learn structure of all Tenses. inthis app you can exercise by using all tenses and also individualpractice. keyword : english, tense, book, english tense book, tensebook, tenses, tense book free, english tense, grammar, tenses inenglish, english grammar, english tenses learning free, grammartense, english grammar tenses, tense, verb tenses, english verbs,verbs, english tense, present, perfect tense, simple present tense,english grammar book free english grammar, grammar books, tensechart, present tense, english verb tenses, english grammar tensesrules, tenses in english grammar with examples, english tensesexercises simple english grammar, all tenses in english, alltenses, tenses rules tenses in english language, english tensesrules, tenses exercises, all english grammar, english tenses withexamples, english tenses table, english grammar tense chart,english tenses chart, grammar practice, tenses with examples,irregular verbs english, list of tenses in english, verb tenseschart, basic english grammar tenses, english verb forms the tenses,tenses in english grammar exercises, english grammar verb tenses,english grammar tenses table, present indefinite tense englishtenses book verbs in english grammar verbs and tenses differenttenses english speaking english grammar book best english grammarbook english grammar all tenses different tenses in english englishgrammar times 12 tenses in english grammar with examples basicenglish grammar book all english grammar rules present tense verbstenses exercises english tenses exercises tenses in english englishgrammar tenses simple present tense exercises mixed tensesexercises present tense exercises verb tenses exercises englishtenses test tension test english tense grammar exercises tensestenses in english grammar exercises all tenses exercises englishgrammar tenses test grammar tenses simple tenses exercises pasttense exercises verb forms exercises modal verb tenses worksheetsuseful preposition preposition practice english tense english tensepractice all tenses in english mixed grammar exercises grammartenses test tenses practice mixed tenses exercises advanced englishgrammar tenses exercises test verb tense worksheets english tensespractice english tenses quiz english tenses test online mixed verbtenses exercises simple present tense worksheet tenses test onlinepresent tenses exercises mixed present tenses test past simpletense past perfect tense present perfect continuous past perfectcontinuous future tense future continuous tense 14 tenses inenglish english grammar tenses in urdu the different tenses howmany tenses are there in english different past tenses in englishlist of tenses with examples english verb tenses practice find verbtenses 4 tenses of verb list of english verb tenses with examplesenglish grammar english english learning app offline learn englishgrammar tenses and usage english grammar test modals in englishnames of tenses in english english past tenses chart easy way tolearn tenses ------ If anyone can learn these lessons and can useit exactly help you to learn English Language very easily. You are preparing for TOEFL? TOEFL Listening is designed withstandard format of TOEFL-listening: 1. Conversations 2. LecturesUseful application for improvement of TOEFL Listening (Conversation& Lectures) 3. Reading Comprehension: Read paragraphs thenchoose correct answer. 4. Sentence Completion: Practice grammar andvocabulary. 5. Incorrect Word: Practice grammar and vocabulary. 6.Synonyms: Practice grammar and vocabulary. - TOEFL Vocabulary isneeded for all 4 skills like TOEFL Speaking, Listening and Reading,Writing. These words can be very helpful if you want to improveyour English reading and writing skills. - TOEFL test , IELTS test,TOEIC test, GRE test, GMAT test, SAT test. App’s Features: ❆ Listen& Read lesson with Audio & Transcripts ❆ Most CommonPhrases with audio supported. ❆ Most Common Words with audiosupported. ❆ English Idioms & Phrases ❆ English UsefulExpressions ❆ Essay for IELTS. ❆ A high TOEFL, IELTS, or TOEIC ❆Help you learn vocabulary 4-5 times faster ❆ Irregular verbs. ❆American Slang. ❆ English Idioms by Categories. ❆ English PhrasalVerbs. ❆ English Pronunciation. ❆ English SAT Words. ❆ EnglishTenses. ❆ Search lesson. ❆ Bookmark manager. ❆ Download audiofile. ❆ Background Audio Mode. ❆ Two listen mode: Online orOffline. Let's improve all of your English skills: EnglishListening, English Grammar and English Speaking right now. - 1000Most Common Phrases: All phrases which use in an application isvery common in a real life, you can practice, speaking and checkresult online. We will give you points. - 1500 Most Common Wordsfrom basic to advance. - Idioms and Phrases in English very easilyand effectively. We have more than 3500 essential English Idiomsand Phrasal Verbs collected and refined from many documents andresources. Quiz feature will help you remember phrases perfectly.It's very easy to use. - 700 common and useful expressions orphrases which you can use to improve and strengthen your Englishskills. With this app, you would like to know how many differentways to say hello, say goodbye or ask someone's health etc.Moreover, you can boost your English vocabulary by learning newwords in various topics such as airport, bank, colors, shops etc.These phrases or expressions can be used not only in your dailyconversation but also in academic writing. All phrases andexpressions in this app are based on Britain English. English through Pictures is the best English learning app for yourchoice. Our app provides more than 1,000 photos to help you learnEnglish quickly. Includes more than 15 topics to choose from:English Grammar, Phrasal Verbs, Learn English, English Expressions,Visual Dictionary, Synonyms, English Idioms, TOEFL, IELTS, IdeasTeaching, English Collocations, English Conversations, EnglishVocabulary, American vs. British English, English Pronunciation.How is everyone learning a foreign language the most effective? Theanswer is to communicate with people and cultures that speak thelanguage. However, not everyone can do it for many reasons, soinstead, they participate in language courses, paying expensivegas. "English through Pictures" uses AI algorithms with more than1,000 images related to a specific language and displays the fourmost relevant images to give users the same learning efficiency asthey are in the country. Say that language. What are the benefitsthat this method of learning brings to users? Functionally, ourbrain is divided into the left and right sides. Our left brain actsas a language foam, while the right brain functions as a picturefoam. In general, the brain must interact first when the image /video appears. "English through Pictures" Most language learnerswill contact words related to a certain image by using only theleft brain. This learning behavior restricts us to reach themaximum potential.